Radiant in a sleekly rounded new design, the PowerShot ELPH 330 HS boasts enhanced built-in Wi-Fi® that enables you to comment on photos and share them to social networking sites quickly and easily - even within specific groups. The powerful new 10x Optical Zoom with 24mm Wide-Angle lens gets you up close and out wide to capture the world in a whole new way, while the Canon HS SYSTEM - the combination of a 12.1 Megapixel CMOS sensor and DIGIC 5 Image Processor - delivers sharply detailed images with vivid, natural color, even in dark lighting. You'll make memories last in beautifully realistic 1080p Full HD video with a press of the dedicated movie button, and use new Hybrid Auto to automatically create an optimized video overview of your day's activities. High Speed AF ensures well-focused action shots, and Intelligent IS delivers blur-free images. And now shoot longer on a single charge with power consumption-reducing ECO Mode. The PowerShot ELPH 330 HS is equipped with enhanced built-in Wi-Fi® for on-the-go convenience when you want to share what you've recorded with friends, family and the whole world. The camera can connect directly to both iOS® and Android™ devices*, and upload images via the free Canon Camera Connect app** without a computer. Easily post your images to your favorite social networking sites through CANON iMAGE GATEWAY# or save them to the online photo album to share anytime, anywhere. The camera's built-in Wi-Fi® also lets you transfer images and video directly to your computer to update friends and family while you're traveling or out and about. Enhanced Wi-Fi® makes posting in real time possible, so you can keep everyone up to date with photos even as events unfold. Easily control the destination of your uploads to social networking sites; share with everyone, or send photos to selected groups. Post to groups, add comments, and edit and upload MOV video files from both iOS® and Android™ devices*. Frequently used devices and accounts are stored in the camera's Wi-Fi® history menu, so you can immediately connect with a simple touch. Share with other Wi-Fi® equipped PowerShot cameras, send images to your computer, and print your photos to Wi-Fi® compatible printers^. Built-in Wi-Fi® on the PowerShot ELPH 330 HS makes it easier than ever for you to express your creative flair, and share it with the entire world! * Compatible with IOS version 5.1/6.0/6.1 or later and Android devices version 2.3/4.0/4.1 or later. 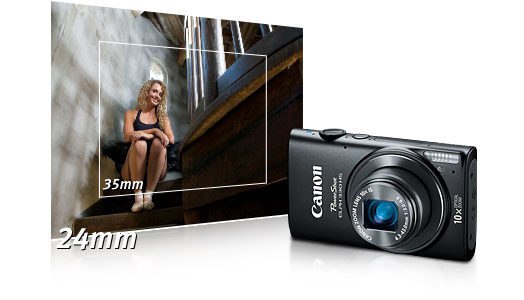 The PowerShot ELPH 330 HS gives you the power to create images with spectacular depth, detail and emotional resonance. 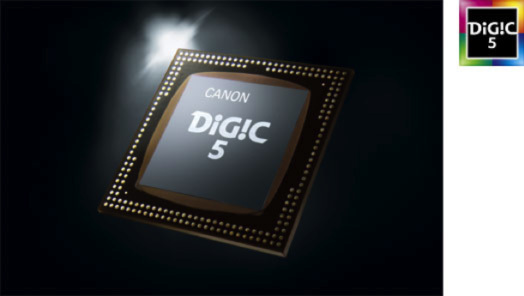 The 12.1 Megapixel High-Sensitivity CMOS sensor works in concert with the DIGIC 5 Image Processor to create the renowned Canon HS SYSTEM. With the Canon HS SYSTEM, you'll experience excellent tracking performance even in low light, and achieve gorgeous still image quality even at high ISO speeds all the way up to ISO 6400; beautiful low-light shots are possible with minimal noise and maximum detail in highlight and shadow areas. The Canon HS SYSTEM lets you use higher shutter speeds to capture clearer images with reduced noise and blur in a variety of situations for incredible photos and even when shooting video. 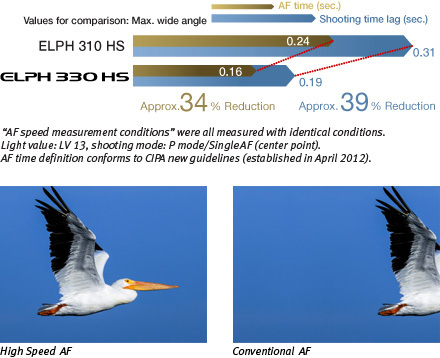 New Hybrid Auto on the PowerShot ELPH 330 HS brings enhanced image quality to the popular Movie Digest feature on PowerShot digital cameras. Movie Digest records up to four seconds of video every time you shoot a still image, then automatically joins the clips into a video that captures the essence of special days: vacations, important occasions, any time you're shooting many shots in a day. With Hybrid Auto, this "highlight reel" is more beautiful than ever. Hybrid Auto automatically recognizes the scene and optimizes camera settings to capture the highest possible image quality. The resulting 720p HD video is properly exposed, crisp and steady. It's easy to capture clear, steady images with the PowerShot ELPH 330 HS, even in low light without using a tripod. That's because the camera is equipped with Canon's innovative Intelligent IS. The system analyzes camera movement and applies the best shake correction method for the shooting situation - allowing you to focus on framing and capturing your shot. For stills, the system automatically selects among Normal, Panning, Macro (Hybrid) and Tripod IS modes. When shooting video, the system automatically selects among Dynamic, Powered, Macro and Tripod IS modes. Normal - Corrects for a wide range of camera movement when shooting stills. Panning - Panning motion is detected so that IS does not interfere with desired camera movement. Macro (Hybrid) - Corrects for shift-type camera shake, which typically occurs in macro (close-up) shooting. Dynamic - Effective for video shooting at wide-angle focal lengths, eliminating the unwanted shaking that typically occurs while walking. Powered - Compensates for hand movement when shooting video at the telephoto end of the zoom range, where camera shake is magnified. 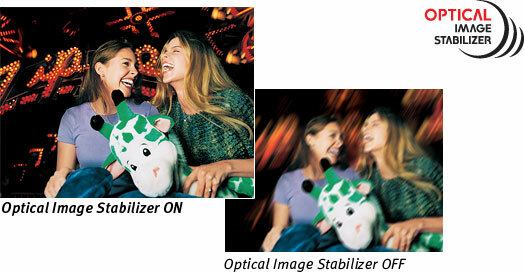 Tripod - When tripod use is detected, the Image Stabilizer is stopped because it is not needed. Smart AUTO - The camera automatically selects the best shooting settings for optimal quality based on subjects and environmental factors to provide point-and-shoot simplicity. Movie Digest & Hybrid Auto - Automatically selects shooting settings for optimal quality and records a video clip every time you capture a still image. One day's worth of clips are then combined into a single video. Program - The camera automatically and intelligently selects the aperture/shutter speed combination based on the shooting conditions. Portrait - Brings the subject into focus while beautifully blurring the background. Smart Shutter - The camera automatically takes the photo when people smile, wink, or get into frame. High-Speed Burst - Captures rapid action frame by frame, by shooting continuously at a high speed while the shutter button is held down. Handheld Night Scene - Take clear and steady pictures at night without the use of a tripod. Fisheye Effect - Now you can get the fisheye effect a classic photographic distortion without a fisheye lens. Miniature Effect - Give images a miniature look with an effect that emphasizes perspective by blurring the top and bottom of the image. Monochrome - Choose from three single-tone effects: Black-and-White, Sepia, or Blue. Super Vivid - Super Vivid intensifies existing hues, saturating the scene with bright colors. Poster Effect - Poster Effect combines several similar shades into one color, turning subtle gradations into eye-catching, scene-popping contrasts. Color Swap - Select a color and replace it with a color you specify for special effects. Snow - Shoot clear snow scenes without darkened subjects or an unnatural bluish tint. Fireworks - Create brilliant images of skyrocketing fireworks. Long Shutter - Use to blur moving subjects for artistic effect, ideal for urban night photography. Stitch Assist - Easy-to-use guidelines simplify the shooting of aligned multiple frames that can later be combined (using bundled software) to create panoramic photos. Movie - Record video; unwanted scenes can be deleted in playback mode. Super Slow Motion Movie - Record your clips in high speed (approx. 240 fps), and then watch your videos in slow motion. * Delay time (0 - 15 sec. (in one-second increments), 20/25/30 sec.) and number of shots (1 - 10 shots (in one-shot increments)) can be specified. - The approximate number of images recordable on memory cards other than the above can be calculated by using the above figures as a reference and extrapolating accordingly. *2 Playback frame rate is 30 fps*1. *3 Actual frame rate is 23.976 fps. Approx. 5.08 oz. / 144g (CIPA Standard)All data are based on Canon's Standard Test Method. Subject to change without notice.